KGR Industriesis a global Rock Drilling Tools Manufacturers and Exporters for construction, mining, tunneling, quarrying and other civil engineering industries including DTH Hammers, Button Bits, Pipes etc. For more than 25 years, our company has designed and developed a distinctly streamlined, user-focused way of serving to our valuable customers. 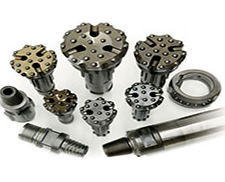 We pride ourselves on the ability to provide you with the drilling tools in all the sizes and in distinctly different industries and environments. We ensure that our worldwide clients have quick access to our services, manufacturing and marketing expertise. By understanding the challenges that you’re faced within mining, construction industry, we offer one of the world's widest ranges of tools and accessories for rock drilling, down-the-hole drilling and grinding. Our wide collecting rock drilling tools those are available to suit your requirements and needs. We're at the differential expansion and then bringing the cutting edge technology for rock drilling tools. Our state-of-the-art products will give you the leading edge as well. We look for outstanding performance in all our drilling products and services. Ultimately, that means excellent quality solutions and low-cost drilling tools to our valuable customers. When it comes to world-class DTH rock drilling tools, you need to look no further than KGR Industries (Rock Drilling Tools Manufacturers).The authenticities of our products are 100% and Guaranteed.